Still, in the New World Translation of the Christian Greek Scriptures, published continuously by the Jehovah’s Witnesses since 1950 (currently in 2013 revision), the above-quoted verse reads, “For I decided not to know anything among you except Jesus Christ, and him executed on the stake.” Similarly, that same translation renders Matthew 10. 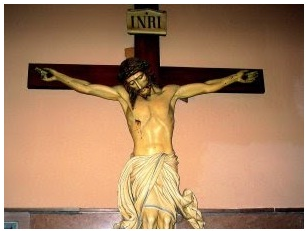 38, “And whoever does not accept his torture stake and follow after me is not worthy of me.” Indeed, nowhere in the New World Translation will we find the physical instrument of our Lord’s death referred to as a “cross”, nor the action itself as a “crucifixion”—the terms recognised throughout the Christian world. 16 comments to Was Jesus Crucified on a Cross or Torture Stake? Peter (admin) thank you link worked. Cross or stake, as many of you have said its Jesus giving his life that’s important so all humanity can be saved. Of course the cross has become venerated symbol by many Christians promoted by the Catholic Church originally. Being a perfect man Adam had to have the last Adam a perfect man as a corrisponding ransom to buy back our inherited sins. 2Tim 2:1-7 nwt so we can recieve the gift of life (unending). The Watchtower is incorrect with their insistence that Jesus did not die on a stake with a crossbeam. The problem with the “cross” issue is the continued denigrating of the beliefs and practices of fellow Christians something the Witness religion insists on doing. We should concentrate on taking the rafter out of our own eye and leave the teachings of other Christian religions for Jehovah and Christ to correct at his coming. It is enough to teach the truth we do not have to ridicule or put down other Christian religions. Another way we can refer to the Ransom for ALL is just say Calvary. Everything was settled at Calvary. We can then bypass the cross/stake issue and cut to the chase namely, The sin of Adam has been paid for and all of his wayward children get the benefit. Adamic death is what we’re concerned about. All mankind has an aquital from Adamic death at their death. Keep It simple……………..K.I.S.S. Many words morph as they are used in new cultures when carried over from an old one. Yes, the word staru started out as Greek word meaning wood or stake, and people were executed on trees. They still are. The Romans used a cross beam to be added on top of the stake so the victim did not die right away from suffocation because their arms were upright and all their body weight was pressuring the rib cadge but suffered prolonged agony before they died. It took Jesus three hours of torture before he expired. The Romans had put another spin on the word by that time so that in the first century it did mean a cross beam. Its no difference than the word mouse which started out just to mean a small rodent but has morphed into also a tool used in this computer age. This small detail should not be used as a tool to look down on other Christians. Religious snobbery takes many forms. Lee Anthony (Brandon) thanks for responding. If it’s unclear in the Bible why take an unconfirmed aspect of how Jesus dies and let it represent your religion by putting it in the front or of a website. If symbols are insignificant, why make it the face of your movement? For me it associates you with mainstream Christianity, the Bible is clear about making objects to even honor God with, to be careful of such things. It is detestable to God. So the same would be said regarding his son Jesus, even more so because HE himself isn’t god. By putting a cross or a stake as a symbol of your religion, opens the door for others to then VIEW it as something they can wear or display as a sign of their “faith” in God. Regarding the symbols within our household, I don’t understand your connection, those have nothing to do with religion. They are corporate symbols. I think I understand. The admin of any of the sites choose to do this, I am not one of them. I have no issue with a cross not used in worship but I also dont have them hanging everwhere as a symbol either. As for the connection on the symbols, I say this only because of my past experience. The Jws i know were always talking of the origins of things such as the cross or holidays as being pagan yet had very little scriptural backing. I see these things as being the same, of pagan origin yet having nothing specifically in the bible saying that they are worthy of death. Our ignorance is not bliss yet if we are unaware of certain things does Jehovah condemn us as a result? Jesus condemned the pharasees often, I love reading these accounts and considering what it means for me as I do my best to not be as they were and condemn others because of certain things that are principals or matters of conscience. The Jws use the stake in their literature, I wonder what is the difference in using the cross if the point being made is the same. (1cor 2:2). The stake may not be on the wall but it is still pushed as necessary to believe and the word used instead of cross. The instrument of the Lords death should be of no matter, the point is that he was given as a ransom for all, he suffered and died, wether a cross or a stake he still gave himself for sin. In the end we shall all know the truth… If the cross will condemn us then it shall surely save others who were ignorant of all but the blood of christ. Lee, your following statement of; ” The stake may not be on the wall but it is still pushed as necessary to believe and the word used instead of cross.” make it sound like the use of “stake” some how has something that is required for one’s salvation! nothing can be further from the truth. The following statement you made is the important point, is something I agree with 100%. The rendering found in the NWT, is a better understanding of the word used. I agree It is certainly not necessary for ones salvation. I remember many being quite uncomfortable when the word cross was used accidentally and the way it is so often talked about and shown in the literature by Jw’s make it seem to be something one MUST understand, at least to progress to baptism. I never found it to be useful debating others or even teaching them things they were wrong about if it wasnt a black and white issue when I was a Jw and pioneering. So necessary for salvation, no, necessary to believe to be a JW, certainly. Cross or stake, let’s just not debate on which we think it was.. How come some Bible students websites show the cross as its symbol? The Bible clearly instructs not to idolize or worship anything or anyone other than Jehovah. So if you also try to follow the Bible complete, shouldn’t this be addressed? Hi, I would agree that which one is not important. I think Jehovah has given us clear instruction in the bible and the most important things are easy to see. If it were a matter of life or death for us to actually know if it was a cross or stake then the scriptures would have made this clear. As for the cross and crown, The cross represents our faith in the death of Christ and our desire to walk in His steps; the crown represents the reward of glory, honor and immortality; and the wreath around the cross and crown represents the Restitution blessings coming to the world of mankind. Using the cross as an object of worship is not acceptable at all, yet the symbol is viewed as such, it seems cause of the controversy over the years. We have symbols on most things, our cars, designs on walls on our homes, clothing etc… Even the names of our days and months of the year are from pagan origin many of which represent false gods or idols yet we use these every day without thinking of it. All these have a meaning of sorts as does the cross and crown symbol. It seems to be more a matter of conscience, even law as opposed to principal. Cross in a Greek word meaning is tree or stake. Some wonder does it really matter which way they did it? Maybe cross is another word for stake. This is a link about when the cross and Jesus were pictured with him on it. Witnesses say at Constantine.